A United States military veteran who dropped out of school in the ’70s to serve his country has finally received his high school diploma. In an emotional graduation ceremony, Army veteran Roberto Garza could be seen dressed in full graduation attire, and even shed some tears of joy after receiving his long-awaited certificate. Roberto’s son recalled the moment that his dad revealed his desire to return to the classroom. So, Roberto was in luck! He could return to his high school and realize his goal of graduating with a diploma, some 47 years after he attended. “Everybody here sees their kids, I get to see my dad. It’s awesome,” his son added. 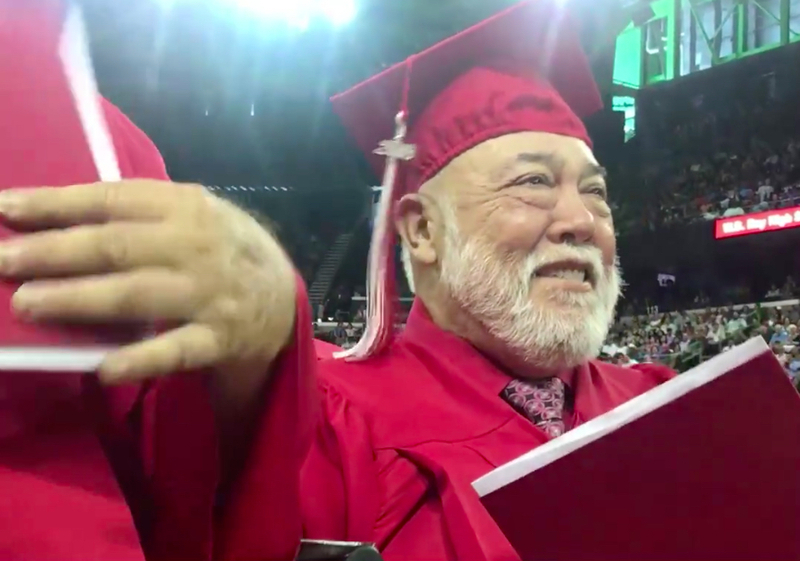 While the crowd waited to see sons and daughters receive their high school diplomas, a son waited to see his father cross the stage to receive the diploma he put on hold 47 years ago in order to serve his country. Alongside Garza’s son were 40 members of his family who had come to celebrate this wonderful milestone in the life of a man who has sacrificed much for his country. “I wish my dad was here,” Garza said as he fulfilled his lifelong dream. The newly graduated Garza says he now wants to become a Texas Peace Officer, as this is what his dad would have wanted for him. Many people posted messages of encouragement on social media in response to the wonderful event. “Congrats. You are never too old to do this. I was out of school 26 years and got mine and went to college and now a nurse,” one Facebook user wrote. “My dad got his when he was 50 after serving in 3 branches of the military…Army, Navy, and the Air Force…served in Korean War. We were so proud of him. He was so proud of himself,” another added. All the best to Roberto and his family in this new season of his life!